Supporting Ohio sheep producers by providing educational information, sheep research conducted at Ohio State, resources, and contact information for leaders in Ohio's sheep industry. As summer approaches, I can’t help but to think about the upcoming breeding sheep show season, when will Mother Nature let us to make our first cutting of hay in southeastern Ohio, and the number of lambs that are on feed in the state of Ohio. For those producers that are feeding out lambs, I have a few management questions to ask. Currently, how are you feeding your lambs? Are your lamb’s offered ad libitum access to feed all day or are you feeding your group of lambs at a specific rate (i.e. percent of body weight)? When formulating your rations, how are you determining the percent protein needed in your lamb diets? Are you feeding a level of protein that is recommended the National Research Council (NRC) based upon the production stage of the animals that you are feeding? I bring these questions up, as these basic management decisions will affect the overall performance of your feeder lambs. Dry matter intake (DMI) and crude protein in the diet can influence the performance and visceral organ mass of lambs. In order to determine these effects, Fluharty and McClure (1996) performed an experiment looking at different feeding strategies and diets with differing levels of crude protein. 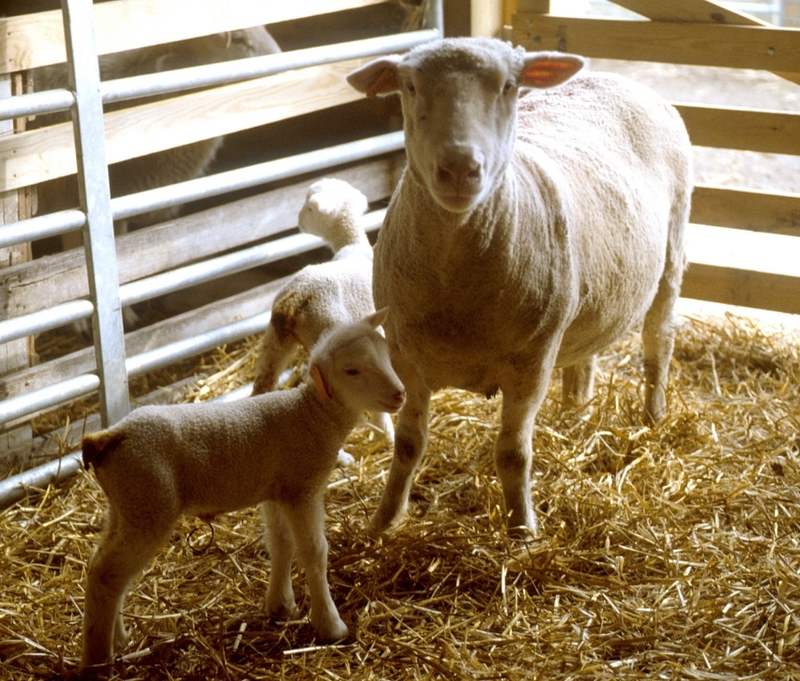 For this experiment, lambs were fed at either 100% or 85% ad libitum dry matter intake and at a crude protein intake at 100% (normal) or 125% (high) of the calculated NRC (1985) requirements. Lambs were monitored over two periods; period 1 (49-79 lbs.) and period 2 (79-110 lbs.). At the initiation, intermediate (time between period 1 and period 2), and final stages of the experiment, 8 lambs per period were harvested in order to determine visceral organ weights and accretion rates. From an animal performance standpoint, during period 1, lambs offered feed ad libitum had greater DMI (2.14 lbs. vs. 1.84lbs. ), average daily gain (ADG; 0.76 lbs. vs. 0.65), and required fewer days (44 days vs. 48 days) on feed to reach 79 lbs. when compared to lambs fed at 85% ad libitum. 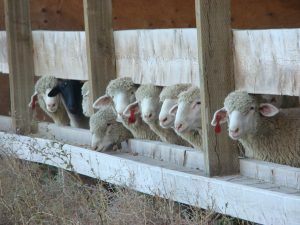 Lambs fed high protein had greater DMI (2.09 lbs. vs. 1.89 lbs. ), ADG (0.78 lbs. vs. 0.63 lbs. ), feed efficiency – gain/feed (0.37 lbs. vs. 0.33 lbs. ), and required fewer days (42 days vs. 50 days) on feed to reach 79 lbs. when compared to lambs fed normal protein. During period 2, lambs offered feed ad libitum had a greater DMI (2.95 lbs. vs. 2.51lbs.) when compared to lambs fed at 85% ad libitum. Lambs fed high protein had greater DMI (2.87 lbs. vs. 2.59 lbs.) when compared to lambs fed normal protein. When combining both feeding periods, lambs offered feed ad libitum had a greater DMI (2.40 lbs. vs. 2.08 lbs.) and ADG (0.76 lbs. vs. 0.65 lbs.) when compared to lambs fed at 85% ad libitum. Lambs fed high protein had greater DMI (2.37 lbs. vs. 2.11 lbs.) and ADG (0.78 lbs. vs. 0.63 lbs.) when compared to lambs fed normal protein. In measuring visceral organ mass, lambs offered feed ad libitum had greater rumen/reticulum, large intestine, and liver weights and faster accretion (deposition) rates of liver, kidney, rumen/reticulum, large intestine, and visceral fat when compared to lambs fed at 85% ad libitum. Lambs fed high protein had greater liver, kidney, and small intestine weights and faster liver and kidney accretion rates when compared to lambs fed normal protein. Overall, diets containing high concentrations of dietary protein increased DMI and ADG throughout both feeding periods. This information demonstrates that feeder lamb feeds low in dietary protein during the growth and finishing periods may limit lamb performance. Restricted feeding of lambs (85% ad libitum) reduced visceral organ mass and therefore increased feed efficiency when compared to lambs offered feed ad libitum. This information shows that restricted feeding of lambs may be more economically beneficial as these lambs require less feed when producing lambs from 49 lbs. to 110 lbs. as more energy is used for animal growth rather than visceral organ mass production and maintenance. Fluharty, F.L. and K. E. McClure. 1997. Effects on dietary energy intake and protein concentration on performance and visceral organ mass in lambs. J. Anim. Sci. 75: 604-610. Posted by Braden Campbell at 8:00am January 4, 2019 Posted in Nutrition, Research and tagged Management, Nutrition. Bookmark the permalink.